Key rings fit in your pocket. If you are a guy and have pockets. Absent any pressure to stay pocket-sized, the load of keys and other items on a key ring can grow, producing very large key clusters which reside in purses, packbacks, or on the belts of guys. BUNGCO says it is time to tame these keys. Introducing the Key Urchin! 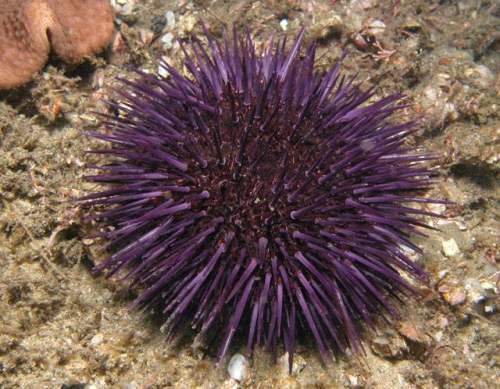 The Key Urchin is a blob from which keys protrude radially, affixed to a central point. Keys each have their space, so no more jockeying for position when the lock is approaching and it is showtime! Give up on that pocket, dude; get your Key Urchin out on your belt, lanyard, necktie or visor where it will receive the love of the world! Bonus: the Key Urchin core can vibrate, causing the Key Urchin to slowly proceed across a hard surface on the points of downward pointing keys. Slow waiter? Time for a Key Urchin race! Loser buys! Take a buckyball shape made out of titanium or highly flexible steel. Cover it with a steel cover. On each face place a set of friction rollers, so keys can be inserted, but a button must be pressed for removal. Battery and vibration mechanism inside. That would work much better than the blob of gummy wax I vaguely envisioned.